Walking on Glyndŵr’s Way, a peaceful National Trail meandering through the open moorland, rolling farmland, woodland and forest of mid-Wales. A unique sponsored challenge for women. 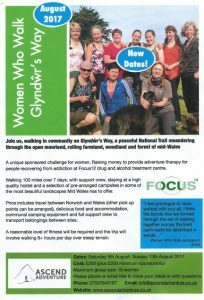 Raising money to provide adventure therapy for people recovering from addiction at Focus12 drug and alcohol treatment centre. Walking 100 miles over 7 days, with support crew, staying at a high quality hostel and a selection of pre-arranged campsites in some of the most beautiful landscapes Mid Wales has to offer.